Sorry. We Don't Make Home Delivery to Your Area Yet.. But, we may soon! 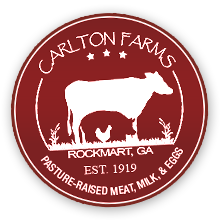 Please send an email to carltonfarm@gmail.com with your address and we will let you know when we are able to make home deliveries in your area. Until then... you can place an order to be picked up at one of our Mobile Market or Drop-Off locations. Browse the map below to find a location convenient for you. Use your browsers back button and choose "Pickup" on the on the previous screen to choose a Mobile Market or Drop-Off location. WE make home DELIVERy TO YOUR AREA! Go ahead and sign up, you can begin ordering today! In addition to home delivery, you may have a Mobile Market or Drop-off location nearby. Browse our map to see the variety of ways you can receive our farm fresh food. Welcome! Please choose a pickup location.